Teak woodenpieces size of 7 X 3/4 inch are held between the fingers which make the noise. Eight to ten dancers stand in a circle or parallel lines. 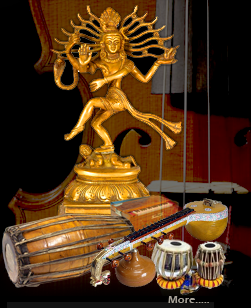 The accompanying songs are generally about gods and goddesses. Devarattam is a pure folk dance still preserved by the descendents of Veerapandiya Kattabomman dynasty at Kodangipatti of Madurai District. It was actually performed once a year near the temple and that too restricted to that community alone. Folklore research scholars have found that Devarattam is a nd his marshalls would dance on the chariot deck. The soldiers and female dancers would form in lines and dance behind the chariot. Today, this dance does not have any songs but only danced to the beat of Urumi Melam, Thappu Melam and sometimes, a long flute. The dancers hold a kerchief in each hand and swing them as they dance. The person leading the dance wears falset when Manmada the God of Love was burnt to ashes by Siva in anger. The villagers separate themselves into two parties as Erintha katchi and Eriyatha katchi and a heated debate ensues. Kaman and Rathi, his consorts, are main characters. This dance is performed in temples during Amman festivals or Navaratri festival. The dancers wear ankle-bells and hold anklets or silambu in their hands, which make noise when shaken. They perform various stepping styles jumps. The dance is in praise of all female deities, the most preferred being the powerful angry goddess - Kali or Durga. Kali Attam or Kolattam This is also known as Koladi, Kolkali, Kambadi Kali and Kolaattam. Sticks one foot length are held in each hand and beaten to make a sharp, rasping sound as the dance proceeds with unique steps, twisting and turning. It is danced by both men and women, during festivals, auspicious days anhurt the other dancers by the swinging 'kol'. Earlier, the 'kols' were brightly painted and decorated with brass rings, bells etc. The dancers used to wear ankle-bells. However, no special dress or make up was used for this dance.